"Only you can prevent wild fires." For over fifty years we have been told that wild fires can be prevented. However, in recent years there have been more fires. Millions of acres have burned. Most people blame the weather. They say it is hotter, drier, and there is less rain. Perhaps there are other reasons. Is there a way to prevent wild fires? 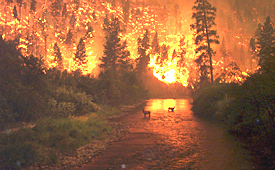 Explore the following websites for to learn more about wild fires. To generate interest and motivate students the teacher should read a recent newspaper article about wild fires. Such as, There is an answer to our wildfire problem. After reading the article the teacher will lead a class discussion. This discussion should be made to help build background knowledge and to give students time to generate questions. Students might ask similar but different questions than those listed here. The more students are guided to ask specific questions, the less inquiry-oriented the activity. What are some misconceptions about wild fires? Are wild fires a natural occurrence? Or are humans contributing to them? How is fire beneficial? How is fire harmful? Has there been an increase in wild fires in recent years? There might be a list of sub-questions that will be asked as well. Why is there an increase? Why are they beneficial? Harmful? Describe differences in acreage burned in the past compared to recent years? Students could be divided in groups of two. They could choose a state and explore the number of acres burned in recent years and in the past. They might then create a spreadsheet to present this data. Then they couldl develop a plan to prevent fires in their chosen state. Fuel- Anything consumable by fire. If a KWL is being used, after each document is investigated students should reexamine what they know, what they want to know, and what they have learned. 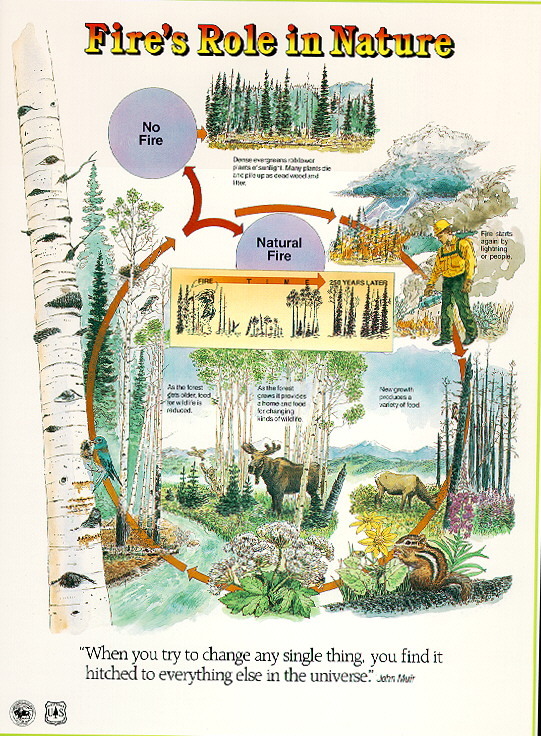 If they are using a concept map, they should begin with the fire cycle and after each document is investigated they should add to or alter their chart accordingly. There is often a giant leap from defining the type(s) of data desired and actually finding the data. Providing guidance to students in finding the necessary data may be necessary. Limiting this activity to the websites provided should provide the necessary resources. However, students are encouraged to explore other sites and alternative articles to aid in their research. Raw data/information usually has to be manipulated before it can answer any questions. Students might be unaware of how data can best be manipulated, so teacher guidance may be appropriate. No result is meaningful unless communicated appropriately. Discussion of findings should be supported. There may or may not be definitive answers to the questions students raised. A poster session of do's and don'ts when camping, etc. Answers often lead to new questions, starting the inquiry cycle over again. 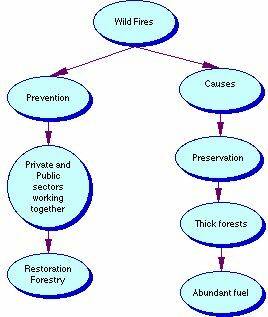 Are forest firest increasing or decreasing in other parts of the world? What happens to people who are caught starting forest fires?